The big move in the currency spread trading markets yesterday was in EUR/USD, as the Eurozone's benchmark interest rate was reduced to a record low of 0.75%. Many of our clients picked the move nicely, as they were short of the market before the rate decision and neatly exited their trades around the lows as well. At the same time as the rate cut, the US ADP employment data came in a touch better-than-expected and provided extra support for the dollar. Consequently, the EUR/USD pair tumbled 135 points to $1.2389. This morning, the market is taking a breather, trading just 10 points lower at $1.2379. The EUR/USD market suffered from a bout of risk aversion yesterday, and the prospect of a drop in the base rate allowed the sellers to push the euro 77 points lower to $1.2526. This morning, the forex markets are still seeing some weakness in the single currency as it has moved a little lower to $1.2515. Economic data comes primarily from Europe today with the UK's PMI services figure one of the highlights. This is expected to slightly decline and may show its first signs of weakness after months of coming in above expectations. Unfortunately for the UK economy, the strength in the services sector has not been enough to prevent a double dip recession. As yesterday's construction figures highlighted, the weakness in the construction and manufacturing sectors is causing the overall recovery to stall. Today will also see the Italian and European PMI services figures, as well as European retail sales and the EU's final reading of GDP. The EUR/USD FX pair added 21 points yesterday, rising to $1.2604, as the US factory orders data modestly improved the sentiment in the currency markets. However, it should be added that volumes were very light ahead of the US Independence Day holiday. Furthermore, there may have been a reluctance to commit too much ahead of the ECB meeting on Thursday. The US dollar benefited from renewed safe haven demand yesterday, as weak manufacturing data triggered fresh concerns of a slowdown in global economic growth. 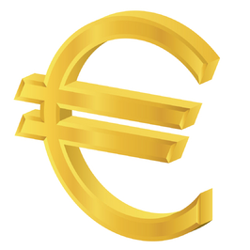 The resulting move saw the euro fall 71 points against the dollar, with the pair dropping to $1.2585. Investors that are spread trading on forex should note that the ECB is expected to lower interest rates by 25 basis points during Thursday's meeting. This is expected to be part of the central bank's strategy to deal with the sovereign debt crisis. The euro/dollar forex pair rebounded 226 points to $1.2666, as the deal by EU officials managed to calm the markets, easing fears of an escalation in the sovereign debt crisis. Expectations of an interest rate cut by the ECB at its meeting this Thursday might also be supporting the shared currency. Usually a rate cut is a bearish event, however, this time could be seen as an indication that the reluctant European leaders are ready to take action. This morning the single currency is at $1.2635. For some reason the big loser overnight was the US dollar, with every major currency, excluding the yen, putting in solid gains. We even saw the USD/CAD market moving lower. This is slightly odd because it's not more dollars that are now going to be issued but more euros, and probably more pounds. The stimulus package of €130bn will not arrive immediately and it seems likely to be a classic example of throwing good money after bad. Without sovereign fiscal control or agreements to force through productivity improvements, any stimulus for the Southern States will merely be window dressing. Financial Spreads' clients are very much mixed in the currency markets, with the bulls and bears almost exactly matching each other in the major euro, sterling, dollar and yen pairs. The euro is struggling at anything above $1.2650/1.2700, but conversely does not like any pressure below $1.2400. In this environment, the range trading investors will be able to make hay so long as they recognise a break out when it happens. The GBP/USD spread trading market is back at its perennial mid-market point near $1.5600, which we have oscillated around since 2009. The chart direction/momentum is still to the downside, notwithstanding the big rally overnight, but the support levels below here get stronger and stronger each time we fail to move lower. The $1.5465/75 level held yet again last night and we are now at $1.5615. However, we are someway off the overnight spike of $1.5680. There is good support at the $1.5600/10 level and below here at $1.5540/50. On the upside there is minor resistance at $1.5633/38 and then the overnight high at $1.5680. In the forex spread trading markets, the euro is probing its recent lows below $1.2450 and the chart is looking pretty ropey. There is huge support around the $1.2300 area but the prospect of massive issuance from the ECB, i.e. printing money, does not exactly bode well. In reality it must be remembered that the euro/dollar market did come into existence well below parity, so this is not exactly virgin territory. The 2010 low of $1.1875 is the natural target for the uber-bears and, unfortunately, there are not many major support levels below $1.2300 to prevent a concerted move. On the upside, we are looking for $1.2450/60 and then $1.2505/15, with $1.2595/05 being the biggest barrier to a bounce. Despite falling to $1.2438 during the morning session, the euro found enough strength to recover and close just 10 points in the red at $1.2491. It seems that the downgrades to Spanish banks, along with Germany's refusal to accept a common European bond, have largely been priced in. It's also possible that forex investors are considering the significance of the upcoming EU summit, not feeling confident enough to commit too much just yet. So far this morning, the euro has not joined the early bounce as the EUR/USD market languishes just below the $1.2500 level at $1.2490. Today's economic data comes in the form of consumer confidence numbers. We've already seen a surprisingly strong figure from Germany this morning and this is currently lifting European stocks. However, this afternoon's US consumer confidence number is expected to decline for the fourth month in a row. The single currency remains the dog of the forex spread trading markets and suffered even more losses yesterday. This morning, the EUR/USD market has removed any prospect of a quick bounce by flirting with the $1.2500 level. It seems that it will take a completely unexpected outcome from this week's summit to boost sentiment towards the euro, but for now the bears remain in control. Near-term support is seen at $1.2470/40, whilst resistance is at $1.2540/70 and $1.2600. The euro climbed against the US dollar on Friday, on the back of speculation that the European Central Bank would step in and announce another package of longer-term loans. The gains were limited however, with the single currency only rising 22 points to $1.2570. This was a sign that the FX markets were hoping for a lot more than the relaxing of ECB collateral terms. This morning's negativity is hurting the euro, taking it back below $1.2500 to $1.2490 at the time of writing.